New research shows that men with depression view their condition in a very negative way, and that depression in elderly men is more widespread than perhaps most of us realize. University of British Columbia (UBC) researchers have determined that in a general sense society has compassion and understanding for men who suffer from feelings of sadness, anxiety, and despair. In other words, depression is an acceptable condition in men. However, men with depression often think of themselves as a burden on people or a disappointment to those around them. As many mental health experts point out, fear of speaking out about depression can prevent a person from getting the help they need and it can make the depression worse, thus leading to all sorts of problems, including isolation. According to the authors of the UBC study, isolation is one of the biggest risk factors for male suicide. The UBC team is suggesting gender-specific programs be created to combat depression in men. The website www.headsupguys.ca is an example of a Canadian-developed online resource for men. While most research to-date demonstrates that women are twice as likely to suffer from depression as men, suicide rates among men who do suffer from depression are higher. The subject of depression and suicide can be frightening, but it is important to keep in mind that not everyone who experiences depression will reach a point of desperation. There are different types of depression. Major depression – severe symptoms that interfere with work, sleep, study, and enjoying most aspects of life. 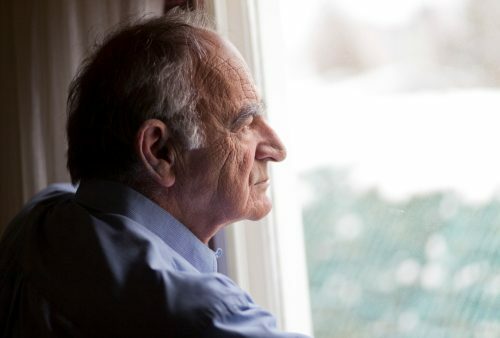 Despite what some people may think, depression in elderly men is not a normal part of aging. We don’t all reach our senior years and become despondent. Men with depression at an older age often have medical conditions, including heart problems, diabetes, cancer, or other health factors that contribute to feeling gloomy. Elderly men may also be depressed over loss of a spouse or other family members, boredom, or loneliness. Retirement can also trigger feelings of depression in men. They no longer have a set schedule to follow, they no longer feel needed or important. This can be hard for them to cope with. As age-related ailments set in and medications are required, depression also onsets – often unexpected. This can sometimes be attributed to the medications being taken. Symptoms of depression in men can include a wide spectrum of feelings and behavioral reactions. Studies show that men are not as “adept” at recognizing the signs of depression as women are – it can take them longer to see that they are just not themselves. Research shows anger is a more dominant feature of depression in men. This could mean anything from being sensitive to criticism or losing sense of humor to having road rage and being violent. Some men become verbally abusive, controlling, and even physically abusive. Men with depression may also exhibit reckless behavior, such as dangerous driving or risky sports. They might drink too much, abuse drugs, or begin to gamble a lot. The causes of depression in men continue to be researched, but we do know that men with a family history of depression may be more prone to develop anxiety and sadness. We also know from looking at scans that the brains of people with depression look different from those who do not suffer from depression. Treatment of depression in men depends largely on the cause of the depression. It’s important to get a proper examination and diagnosis so the right treatment method can be applied. For some people, psychotherapy is an important first step in treating depression. It can help a person modify behaviors that might be contributing to the depression. There are also peer support groups that can help men learn from each other about depression and coping strategies. It has also proved to be helpful for men to know that they are not alone in their fight against depression. There are times when medication is required for treating depression in men. The medications can help relieve symptoms and allow people to explore and change behaviors. It is important to understand the medications being prescribed and to maintain contact with a doctor to ensure that regular health monitoring takes place. Herbal remedies are also available. If a person is considering herbal remedies to fight depression, they should consult their doctor, especially if they are on medications for any other medical reasons. Lifestyle changes, such as regular exercise, eating a well-balanced diet, and getting a good night’s sleep, have all proved to be good ways of treating depression in men. Even if you need other treatments, living a healthy lifestyle can help keep some of the symptoms at bay. Although it can be a challenge in our hectic, fast-paced society, trying to reduce stress is also highly recommended if you tend to suffer from depression. Studies show that stress can make symptoms of depression even worse. As mentioned earlier, isolation can be a big problem. So if you tend to feel anxious or depressed, try to build a social network to help you. Don’t hide from your family and friends. Most people will actually be flattered that you asked them for support. One way you can ask them to help is to include you in activities. Also, you can try forcing yourself to get involved, even when you really don’t feel like it. Being around others will make you feel less sad and prevent you from getting involved in destructive behavior.